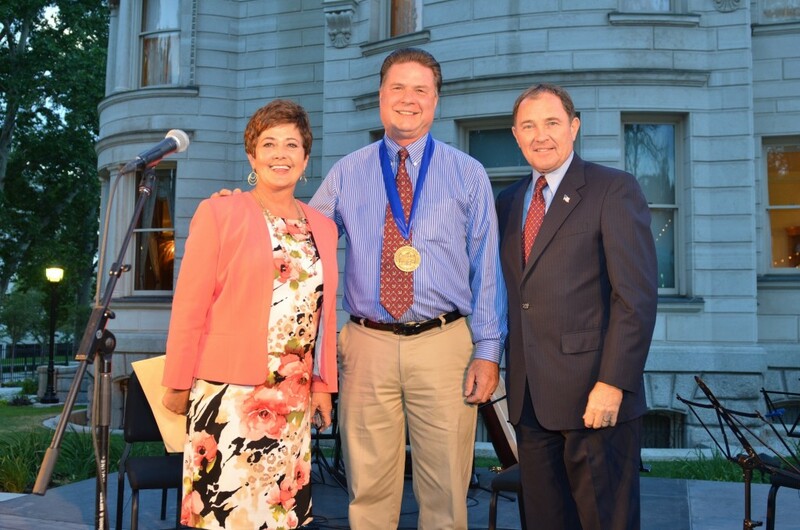 This week, Roland Lee and Craig Jessop were honored with a Governor’s Artist Award medal at the Governor’s Mansion in Salt Lake City. The awards are given annually to a visual artist and performing artist who “have made significant contributions to the arts in Utah.” Governor Gary Herbert and First Lady Jeanette Herbert made the presentations before about 150 guests at a special dinner and reception held at the stately Kearns Mansion, which was donated to the state by the Kearns family. St. George artist Roland Lee has been acclaimed for his work depicting the natural wonders of Utah and surrounding states. He is featured in the books Century of Sanctuary: The Art of Zion National Park, Art of the National Parks, Painters of Utah’s Deserts and Canyons, Contemporary Western Artists, Artists of Utah and others. “I am honored to receive this award for doing what I love so much,” said Lee. “Utah’s scenic wonders are beyond compare. We are blessed to live in a place so rich in scenic beauty, and I thank God each day for the gift of art in my life.” A selection of the artist’s works were on exhibit the day of the ceremony. You can view the artist’s work at www.rolandlee.com. Craig Jessop, currently the Dean of the Caine College of the Arts (CCA) at Utah State University, was formerly the director of the Mormon Tabernacle Choir, from 1999-2008.